I read this article and found it very interesting, thought it might be something for you. 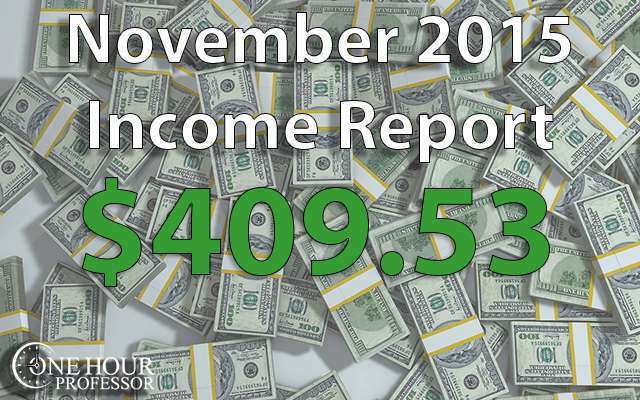 The article is called November 2015 – Monthly Income Report and is located at http://www.onehourprofessor.com/november-2015-monthly-income-report/. I know, I know, you guys are probably mad at me. I have been REALLY bad about updating the OHP website and it’s taking me about twenty days too long to publish this income report. You’re probably wondering if I’m still active or if I even care, and I assure you I do! Though you wouldn’t know it, I’ve been working extremely hard on another authority website and a few others things which I’ll cover in the report that tell you what I’ve been doing and why I haven’t been blogging regularly. My focus this month has been all about my new authority website. As some of you will recall, I created an Authority Website (and a FREE mini course which you can get by clicking here) that was pretty successful. After doing that and getting done with my course, I decided the next thing I should do is create ANOTHER authority website because that’s really the first thing that I’ve done that has made me some decent income (somewhere around $125-$175/month). With that being said, below is where I spent my time this month. NEW Authority Website: I am not comfortable with disclosing the subject or content of this authority website yet because it’s still a little too early. It’s definitely a topic that is trending right now and should continue to grow as time goes on. It took a lot of work, but amazingly I was able to get it launched in about one month. The reason why I am doing this authority website is simple, there is a good opportunity and I can make money. I have spent time trying to sell products and that hasn’t really gone well, so sometimes you just have to follow the money and in order to keep doing this for a living, I need to make some moves. This is my attempt to keep things going. NEW Consulting website: In addition to creating the new authority website, I was also able to start on a new consulting website I’m working on. After getting various consulting clients without even trying, I’ve decided that maybe it’s time to actually try to get more clients. These clients are all working professionals in a specific niche that will benefit from someone managing their Google Adwords campaigns. I choose to do this consulting because it is more passive than working hourly as I can do a lot of things on my own time and whenever I please. JFFHub Authority Website: This website is on complete autopilot now. I do not write anything or really do any work, and it should continue to provide me with a couple hundred bucks a month. The only expenses related to this are the articles I have my writer draft, but that only costs $10 each. 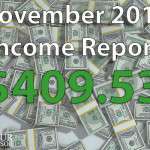 BLOG: November 2015 Income Report: As always, I created my income report for November and though it wasn’t record breaking, I did make a few bucks. Facebook | Twitter | YouTube | Google +: Next we had the typical social media account which is never a large amount of time. COURSE: Building a Successful Authority Website: So I really did spend a ton of time and money on this course and for whatever reason, it pretty much fell flat. I did get a few sales, but nothing substantial and amazingly, none from the OHP website. Overall, my income this month was just under $500. I’ve had better months and I’ve had worse months, but overall I am happy with my performance considering I made a new website and covered expenses. Shutterstock: Had a few images purchased through this affiliate this month. Wasn’t a bunch, but money is money. Google Adsense: My revenue here continues to grow just as my Authority Website does. I don’t think we have hit the maximum amount ill make just yet, but that day is quickly approaching. As of now, all of the income from Google Adsense is related to JobsForFelonsHub.com and this isn’t a highly advertised channel so it’ll never reach hundreds of dollars each month. YouTube Channel: Again I saw respectable earnings from YouTube this month and that’s with no new videos. Year to date I have made a respectable sum of money through YouTube and do absolutely nothing any longer for the channel. I may release some videos in the future, but as of now this is pure passive income. Indeed.com: My income from indeed was similar to last month, but the cool thing is that every single day I am seeing a contribution. This is big because it means I am consistently getting people to use my affiliate links and job searches. Udemy: Really big month for Udemy because I launched my course and had a lot of Black Friday sales, but I know this number will fall off greatly in December. Happy to see over $200 on the platform though, wish i could do this each month. Bluehost: I had another person create a website this month and I’m always happy to see when these commissions come in because it means I’ve inspired somebody out there to create their own website. There is no better feeling than knowing you were the cause of helping someone start a business because it took them a lot of guts to get going. Consulting: A good month of consulting in the books as I had numerous clients asking for work, and I had a client ask for a proposal for website maintenance this month. If that goes well, it’ll be a nice retainer deal that will consistently give me income each month. As I mentioned previously, I plan on increasing the income in this channel because, well, I need to pay bills and this is the only one that seems to really pay. Aweber: Typical income numbers on my email platform this month. This is due to people signing up in the past and trusting that this email solution works. And FYI, it does, incredibly well too. Expenses this month weren’t as high as last month (thank goodness!) but I still had some things going on. Udemy: I saw a cool course on Amazon FBA available and splurged by purchasing it for $2. Though this does nothing for me now, in time I plan on trying out Amazon FBA so I wanted to get a good resource. Hostgator: This is my recurring hosting fee and will be going away for Hostgator shortly. I won’t get into details, but they really pissed me off this month and couldn’t get a domain name I purchased to aggregate on their servers. When the support made me wait hours to get an answer, I decided it was time to go to a better company. Fiverr: I spent $20 and got 4 logos for my new authority website. If you are looking for a logo, use this service. It’s super cheap and if you find two providers and have each do a job for $5-$10, you’ll save a bundle. Shutterstock: I had to buy one large image for my new Authority website for the homepage, and I always use Shutterstock when I do this. CreateaClickableMap: On this page of my JFFhub authority website you’ll see that I have a clickable map. I basically needed the exact same functionality on my new authority website, so I bought a few more maps from this service to make it happen. Call Rail: This is the platform that I’ve been using to record my client calls for my paid search consulting gigs and if I’m able to do what I need to do, this cost will likely rise soon. OIO Publisher: One thing with the new authority website that I was in need of is an ad serving platform. This way, I could make it so that people are able to purchase an ad space for the specific state that their local business is located in. More on this in coming months if it starts bringing in income, but this is a way for me to sell actual advertising on my website. Namecheap: I decided to consolidate all of my domains to one provider this month. Why did I decide to do that? The answer is simple. I had domains at GoDaddy, Bluehost, and Hostgator. Not a huge deal, but I am a neat freak and when everything is disorganized it drives me crazy. So, I paid to have everything transferred to Namecheap so i can keep track of all of it in one place. Siteground Hosting: Hostgator did me wrong and now that I have a handdful of websites, I need a plan that is optimized to handle my volume of traffic and is optimized to give me the best experience. After reading a TON of reviews and doing research, I am migrating to Siteground and so far, so good. Upwork.com: Again, an area where I spent a lot of money this month. Most of it was for paying a researcher to complete various databases of information, paying a developer to make some small fixes, and paying writers to complete articles for me. It is almost laughable at how badly I failed this one. But after not making any course sales and not seeing much income from my efforts, i decided it was best to focus on where the money is and create a new authority website. If this new authority website works well, I’ll probably focus on making more websites on various subjects. There was plenty of this done this month. I actually created my own mini course (get it here) and also created a three tiered course offering for my visitors. Though I’ve had a lot of people jump into the funnel, none have purchased on the OHP website. I’m waiting for this to get to 100 mini course enrolls and then I’ll see what my conversion rate is and go from there. I demolished this goal. Not only did I begin creating the new course, but I finished it AND created a mini course. Granted, sales have been weak, but I am glad I got it done. I am working on this new authority website and although it’s going well, it isn’t done yet. I need to get the website done before January 1st so that i can focus on my consulting gig. I gave myself 12 months to make a decent living while doing my own thing and right now we are about 9 months in. I’m able to survive currently, but I need to be able to thrive and I think this Adwords consulting stuff could be the ticket. We will see what the future holds, but I have high hopes as this is a specialized skill. I’m a big fan of researching and planning prior to embarking on any new website or project. I have never had to try to get consulting clients before, but now I am going to put a ton of work into it and we will see if I can come out on top. The reason is that if I have consulting clients, it is recurring income that I can use to survive while I continue to make authority websites. Over time, I am planning that my authority websites will make thousands each month, but for now I need to find something that pays quick and Adwords consulting is it. I can’t help feeling like you’ve gotten a little ahead of yourself here. You seem to have declared your first authority website a success and produced a course about how you pulled it off – but I thought you were aiming for $1,000/month income from it? Looking at your past income reports it appears you’ve spent a four-figure amount on developing that site (excluding your own time), so it’s got a long time yet before it reaches the payback point. I’m not sure that rushing into building another site straight away is really the right move. Have you done everything you can to promote the first site and make it a success? Even though I questioned the niche when you chose it, based on the evidence so far I’m sure you could be making substantially more than $175/month. I do think you’re absolutely right to focus on the consulting work, though, as that appears to be where you’re having the most success. Thank you for chiming in and the constructive criticism. As good as the JFFHUB website has been, the main limit it has is its money making potential based on the market. I came to this conclusion after surveying my audience on a. Product they’d like me to make and after they said an audio e-book would be great, I made it and only sold one copy (to over 500 people). I’ll hold on to this site for quite some time and although it will never reach my income goal of $1000+ per month, I do think it was an amazing learning experience and I learned a lesson in choosing a niche that has more disposable income. I genuinely feel like I have done a lot to promote that first website and I really don’t see it ever growing to the levels of $500+ per month because the income sources just aren’t there. I may have someone develop more content for the website in the future, but for now I need to stop spending and just sit back and collect for a little while. The consulting is going to be my main focus in the New Year as I pretty much have to get 3-5 clients to really thrive as opposed to survive. I may consideri blogging more about it on OHP as I’ve been a ghost lately, but right now my time is all about ROI as I have to make a living. Great answer, Ron. Thanks for being so honest. I hope the consulting quest gets off to a good start.